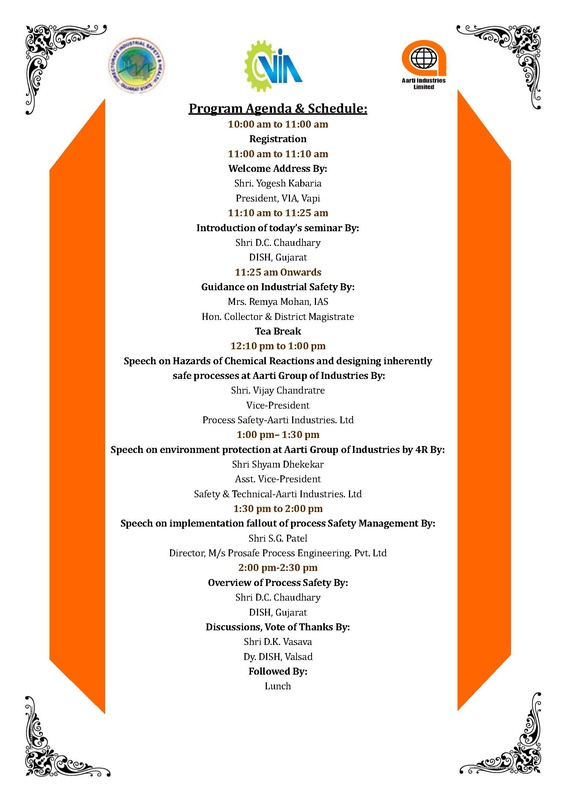 Vapi Industries Association is organizing a seminar jointly with Director of Industrial Safety & Health (DISH) & Aarti Industries Ltd. at 11:00 am on 23rd September 2016 at Centre of Excellence, GIDC, Vapi. The seminar will be graced by the Hon’ble Collector of Valsad, Smt. Remya Mohan IAS and Shri D C Chaudhary, Director of Industrial Safety & Health, Gujarat. You are cordially invited to remain present in the seminar to get to know more about Industrial Safety & Health.